Traditionally, investors have chosen to diversify their portfolios by investing in stocks and bonds. But in recent years, new asset classes have emerged and are today being embraced by investors worldwide. These “alternative” investments include commodities, private equity, venture capital, hedge funds and real estate. In this article, we explore the benefits of investing in real estate and how you can get started today. To begin with, real estate has historically been a less volatile asset class than stocks*. This can be attributed to the fact that the stock market’s prices fluctuate drastically and thus many investors end up buying and selling at the wrong times, which in turn eradicates previous gains. Additionally, contrary to the stock market, real estate does not have ‘emotional buying and selling’ nor panic selling. Investment in conventional businesses may not generate a positive cash flow nor yield profits for many years. That is why real estate has been luring an array of investors as it can produce a steady cash steam almost immediately once tenanted. Moreover, investors can further increase their profits over time by gradually raising the monthly rent. An additional benefit of investing in real estate is asset value appreciation. This means that the longer one holds onto an asset, the greater chance its value will increase. So, in a way, it’s like you’re getting paid to hold on to the asset**. There are unique tax benefits bestowed upon real estate landlords. These tax benefits include the following tax deductibles: interest expenses on the mortgage, operating expenses, property taxes, insurance and depreciation (exactly how much is deducted is contingent on the rental income) ***. For this reason, the tax benefit can be highly valuable to real estate investors as they receive a tax credit on the cost of an asset that is projected to be going up in value. Given the above, one might conclude that getting started in real estate investing is ‘a walk in the park’. However, this is not necessarily the case as in order to be successful in real estate investing, one must conduct comprehensive research to identify the ‘best’ opportunity, acquire real estate expertise and ‘know how’, as well as hold large sums of capital. Therefore, it comes as no surprise that it’s not recommended for ‘regular folks’ to just start investing in real estate as they can put themselves in danger of losing their investment funds. This is where iintoo comes in. iintoo provides a social investment platform that enables ‘regular folks’ (or investors who are lacking in real estate knowledge and experience) to invest starting at $25,000. 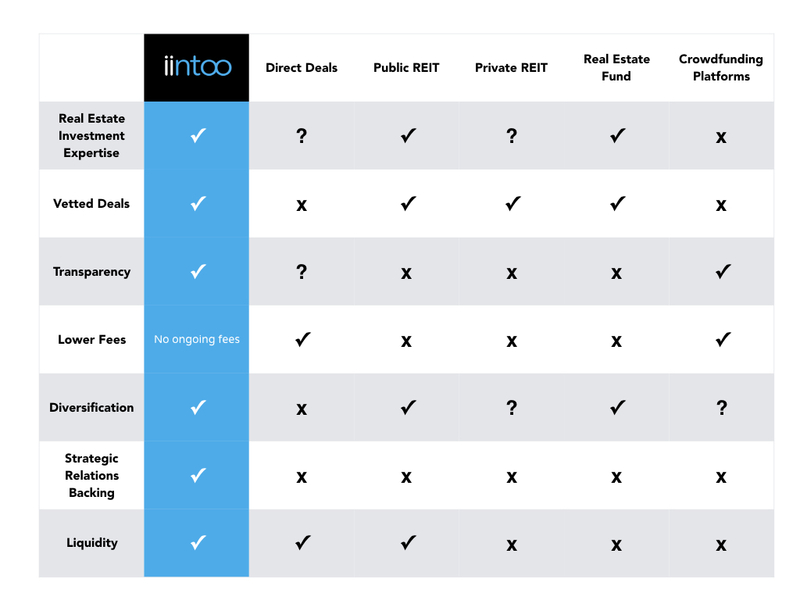 The below chart highlights some of iintoo’s advantages as a way of getting started in real estate investing.